Do you need to write or request an employment verification letter? Employees may need these letters for landlords or financial institutions if they are trying to rent or purchase a home. They're also sometimes necessary for insurance reasons or to confirm that an individual worked at a company during the dates given on a resume or job application. Read below for advice on requesting a letter, writing a letter, a sample employment verification letter, and templates to use to create a letter to provide proof of employment for current and past employees. If you are requesting an employment verification letter from a current or former employer, it's important to ask for the letter in a professional way. First, check in with your Human Resources (HR) department. 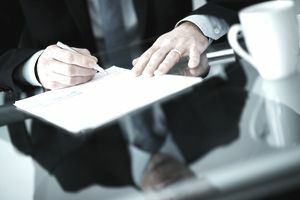 The company may have a policy regarding the release of information, and you may need to give permission for your employment history to be released to a third party. Often, your HR contact will compose the letter for you or provide you with a template to give to your manager. You can also ask your manager or supervisor directly. Offer a template or sample letter as a guide. Be sure to provide them with all the information they need to write the letter, including who to address the letter to and exactly what details need to be included. What Is Included in an Employment Verification Letter? Do you have to write an employment verification letter for someone? Below are some tips on how to write an employment verification letter, and what to include. Follow business letter format. Use official business letter format when writing your letter. Include your contact information at the top, the date, and the recipient’s contact information (if you have it). Be sure to include a salutation at the beginning and a handwritten signature at the end. Keep it concise. Employment verification letters should not be lengthy. Do not add any information beyond what the employee asks – for example, do not provide an evaluation of the employee’s work. Include all requested information. Most employment verification letters include the person's name, their department in the company (sometimes you need to include their specific job title), and the amount of time they have been employed. Check with your employee if any additional information needs to be shared. For example, some letters include the person’s salary, how often they are paid (weekly, bi-weekly, etc. ), and how many hours a week they work. However, do not include these extra details unless requested. Provide your contact information. At the end of the letter, offer to answer any additional questions. Provide a form of contact for the recipient, such as your phone number or email. Edit and proofread before you send. This letter is likely very important to your employee or former employee – their housing, future employment, or insurance may depend on it. Take the time to make this letter as professional as possible. Read through the letter for any errors. It is a good idea to review letter examples before writing an employment verification letter. Along with helping with your layout, examples can help you see what kind of content you should include in your document (such as dates of employment). You should tailor a letter to fit the particular employee you are writing the letter for, and the information he or she asks you to include. While examples, templates, and guidelines are a great starting point in your letter, you should always be flexible. This letter is to verify that Seneca Williams has been employed at GMC Associates for the past three years in our Accounting Department. She began work on August 1, 20XX. If you require any additional information, please feel free to contact me at 555-111-1212. This letter is to verify that (employee name) has been employed at (company name) since (start date). If you require any additional information regarding (employee name), please feel free to contact me at (your phone number). This letter is to verify that (employee name) was employed at (company name) from (start date day/month/year) to (end date day/month/year).